NOTE: Copyright© of the photographs of Maharaja Jitendra Narayan Bhup Bahadur, Maharani Suniti Devi, Maharaja Sayaji Rao III Gaekwad, Maharaja Nripendra Narayan Bhup Bahadur, The Princes of Cooch-Behar, and Maharaja Raj Rajendra Narayan Bhup Bahadur are property of the V&A Museum (Victoria and Albert Museum) London to whom all rights are reserved. They are part of the Lafayette Negative Collection. Click the link above to go to its home page. Maharani Gayatri Devi's father, His Highness Maharaja Sri Sir Jitendra Narayan Bhup Bahadur, Maharaja of Cooch-Behar. He ascended the throne in 1913 after the premature death of his older brother, the Maharaja Shri Sir Raj Rajendra Narayan Bhup Bahadur. (above left) The ever gracious Maharani Suniti Devi of Cooch-Behar, Maharani Gayatri Devi's paternal grandmother. 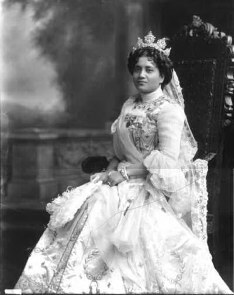 (Above right) Maharani Suniti Devi in European Court dress which she wore for the coronation of King Emperor Edward VII on August 9th 1902. She posed for this picture during her visit for the coronation. Maharani Suniti Devi is daughter of the famous Brahmo Samaj leader Keshab Chandra Sen. 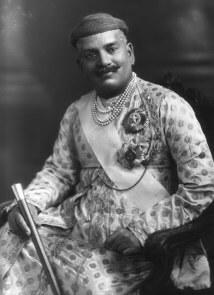 Colonel His Highness Maharaja Shri Sir Nripendra Narayan Bhup Bahadur (Maharaja of Cooch-Behar) was born on 4th October 1862, and is Maharani Gayatri Devi's paternal grandfather. He is the son of Maharaja Shri Narendra Narayan Bhup Bahadur and Maharani Nishimayi Deo Aye Devati. He succeeded his father when he was just ten months old on 6th August 1863, and ruled under a Regent Council until 8th November 1883 when he was given full ruling powers. He married the Maharani Suniti Devi Sen on 6th March 1878 and died on 18th September 1911. 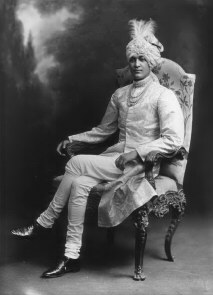 Their oldest son, Maharaja Raj Rajendra Narayan succeed to the throne. 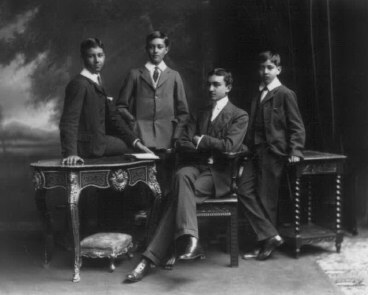 Maharani Gayatri Devi's father and uncles, the maharaj kumars (princes) of Cooch-Behar. (From Left to Right) Maharaja Shri Sir Jitendra Narayan Bhup Bahadur, Lieutenant Colonel Maharaj Kumar Shri Victor Nitendra Narayan, Maharaj Shri Raj Rajendra Narayan Bhup Bahadur, and Lieutenant Colonel Maharaj Kumar Shri Hitendra Narayan. 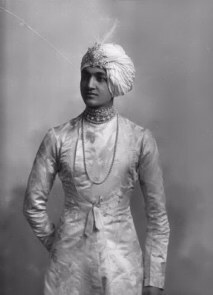 His Highness Maharaja Raj Rajendra Narayan Bhup Bahadur the Maharaja of Cooch-Behar. On his untimely death, Maharani Gayatri Devi's father ascended to the gadi (throne) of Cooch-Behar. 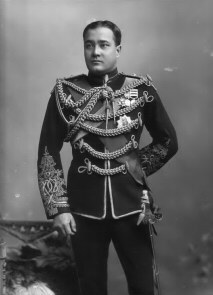 His Highness Maharaja Sayaji Rao III of Baroda. Maharani Gayatri Devi's maternal Grandfather. All the pictures above belong to the Lafayette Negative Collection. Please read the note at the top of this page. 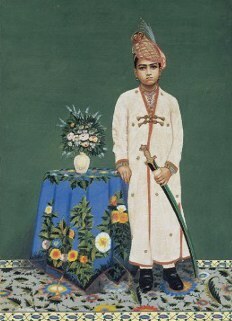 Kumar Mor Mukut Singh of Isarda (The son of the Raja and Rani of Isarda) at the time of his formal adoption as Maharaj Kumar of Jaipur on 24th March 1921. He would rule as His Highness Maharaja Sawai Man Singh II of Jaipur. The following is the official title of the Maharaja of Jaipur. 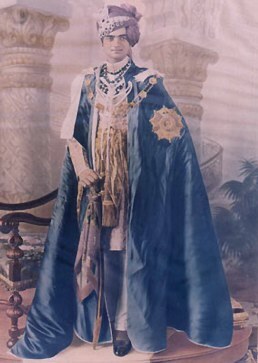 His Highness Saramad-i-Rajaha-i-Hindustan Raj Rajendra Maharaja Dhiraj, Lieutenant-General Sir (personal name), GCSI (Knight Grand Commander of the Order of the Star of India), GCIE (Grand Commander of the Order of the Indian Empire), Maharaja of Jaipur. 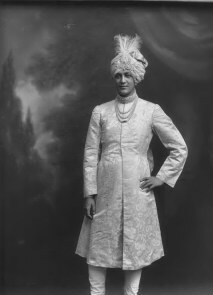 His Highness Saramad-i-Rajaha-i-Hindustan Raj Rajendra Maharaja Dhiraj, Lieutenant-General Sir Man Singhji Bahadur the Second, GCSI (Knight Grand Commander of the Order of the Star of India), GCIE (Grand Commander of the Order of the Indian Empire) Maharaja of Jaipur. TRANSLATION: His Highness, First amongst the Rajas of India, Lord of Princes, Great Prince over Princes, Lieutenant-General Sir Sawai Man Singhji Bahadur the Second, Knight Grand Commander of the Order of the Star of India, Grand Commander of the Order of the Indian Empire, Maharaja of Jaipur. the future Raja of Isarda. 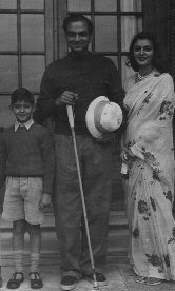 The Maharaja Sawai Man Singh II and his second Maharani. 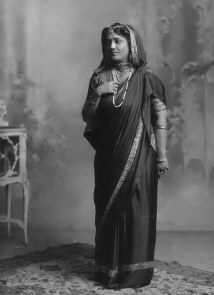 The Maharani Shri Kishore Kunwar Devi Sahiba was the daughter of the Maharaja of Jodphur and the niece to Maharani Marudhar Kunwar Devi Sahiba. 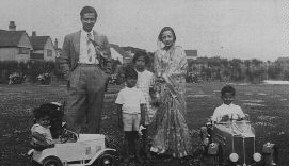 The Maharani Kishore Kunwar's father and Maharani Marudhar Kunwar are brother and sister. The children in the picture are as follows: Standing in the middle of the Maharaja and Maharani are Princess Prem Kumari (daughter of Maharani Marudhar Kunwar) and Prince Jai Singh (son of Maharani Kishore Kunwar). Sitting in the toy car next to the Maharani is the heir to the Jaipur Gaddi Prince Bhawani Singh (Son of Maharani Marudhar Kunwar). Lastly sitting in the toy car in front of the Maharaja is Prince Prithviraj Singh (son of Maharani Kishore Kunwar). 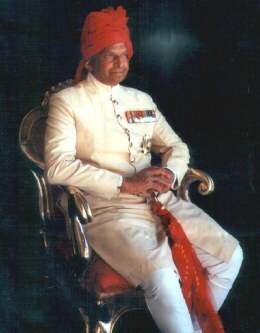 His Highness Maharaja Sawai Bhawani Singhji is the current Maharaja of Jaipur. He is also known as Bubbles amongst his family members. He is the son of Maharaja Sawai Man Singh II and his first maharani the Maharani Shri Marudhar Kanwar Devi Sahiba, daughter of the Maharaja of Jodhphur. He was born on October 22, 1931. The Maharaja ascended to the Jaipur Gaddi in 1970 after the untimely and accidental death of His Highness Maharaja Sawai Man Singh II. Brigadier His Highness Saramad-i-Rajaha-i-Hindustan Raj Rajendra Shri Maharajadhiraja Maharaja Sawai Shri Bhawani Singh Bahadur, Maharaja of Jaipur. After the independence of India the orders and titles given to the Maharajas of the Princely States by the English crown were no longer valid. Along with their thrones the Maharajas also lost their titles. The Maharani Padmini Devi was born in October 1937 to His Highness Lieutenant-Colonel Maharaja Sir Rajendra Prakash Sahib Bahadur, Maharaja of Sirmur. Maharaja Bhawani Singh and Maharani Padmini Devi were married on 10th March 1966. Maharaj Kumari Diya Kumari Baiji Lal Sahiba. 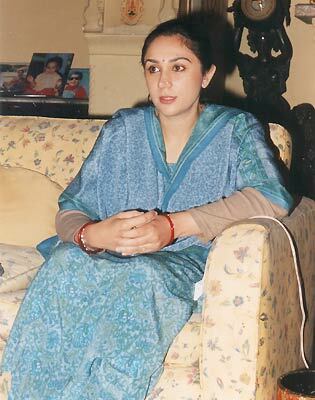 She is the daughter of Maharaja Bhawani Singhji and Maharani Shri Padmini Devi Sahiba. In 1970 the Maharaj Kumari Diya was born. 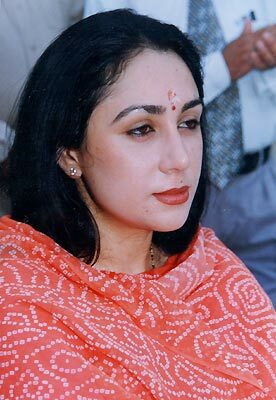 In 1997 she married Narendra Singh Rajawat a courtier in the court of Jaipur. He is the son of Thakur of Kotda a village in Tonk. 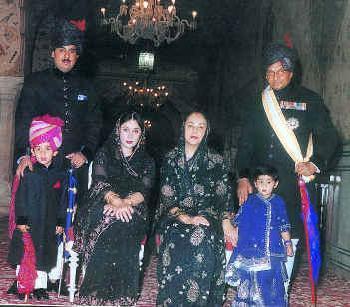 On November 22, 2002 the Maharaja Bhawani Singh adopted Diya Kumari's five year old son, Padmanabh Singh, as the Yuvraj of Jaipur. The Jaipur Royal family with the Prince and Princess of Wales. (left to right) Her Highness Maharani Shri Padmini Devi Sahiba, His Royal Highness Princes Charles, Maharaj Kumari Diya Baiji Lal Sahiba, Her Royal Highness Princess Diana, and His Highness Maharaja Sawai Bhawani Singh. A family picture at the wedding of the Maharaj Kumari. (left to right) The Maharaja Sawai Bhawani Singh, Narendra Singh Rajawat, Maharaj Kumari Diya Kumari, Maharani Padmini Devi. This is the current royal family of Jaipur. Standing on the right with a white sash is His Highness Brigadier Maharaja Sawai Bhawani Singh. In front of the Maharaja in the blue dress is his granddaughter Gorvi Devi. Seated next to her is Her Highness Maharani Padmini Devi. 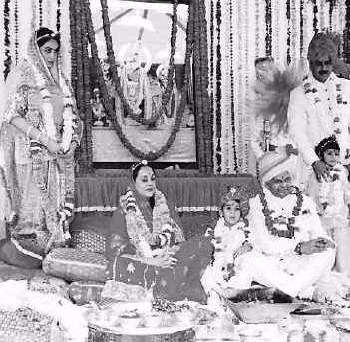 * The Princess Diya Kumari is seated next to the Maharani, and standing on the left is the princess's husband Mr. Narendra Singh. Finally the heir to the Jaipur Gaddi, Maharaj Kumar Padmanabh Singh is standing in the pink turban. He is the son of Princess Diya Kumari and Mr. Narendra Singh, and was recently adopted by Maharaja Bhawani Singh accompanied by a stately ceremony as the heir to the Jaipur Gaddi. 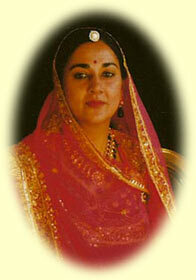 *Maharani Padmini Devi is a princess from the Princely State of Sirmur. The adoption ceremony of Kumar Padmanabh Singh by His Highness Maharaja Bhawani Singh and Her Highness Maharani Padmini Devi on Friday November 22, 2002 as the heir to the Jaipur Gaddi. Standing in the back is Padmanabh's mother, Princess Diya Kumari, and his father Kumar Narendra Singh. His little sister stands in front of Kumar Narendra Singh. Click here to read the article on the adoption. 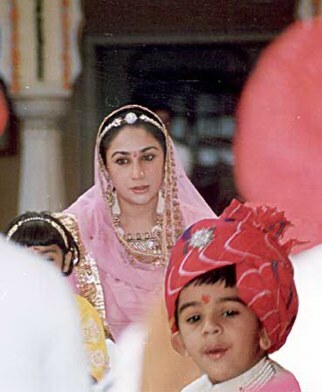 Princess Diya Kumari and her son the newly adopted heir Yuvraj Shri Padmanabh Singh Sahib. 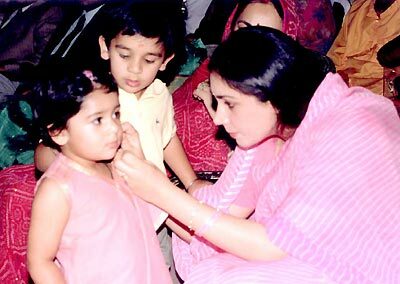 Princess Diya Kumari with her daughter, Gorvi Devi born 1999. Her son, Yuvraj Shri Padmanabh Singh, stands behind his baby sister. 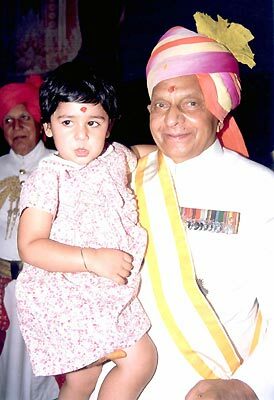 His Highness Maharaja Brigadier Sawai Bhawani Singh with his grand daughter, Gorvi Devi. 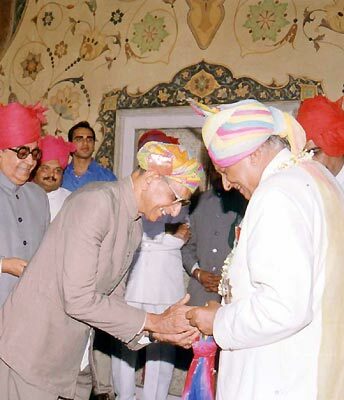 People congratulating the Maharaja Brigadier Sawai Bhawani Singh on his birthday at City Palace, Jaipur. 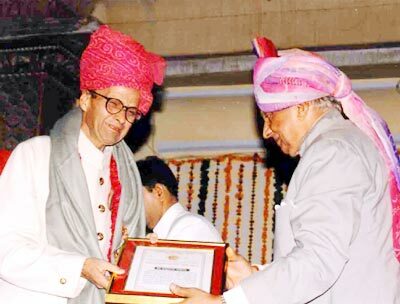 The director general of Sawai Man Singh Museum Trust, Yaduendra Sahai, being honoured for his contribution to museology by Maharaja Brigadier Bhawani Singh of Jaipur. 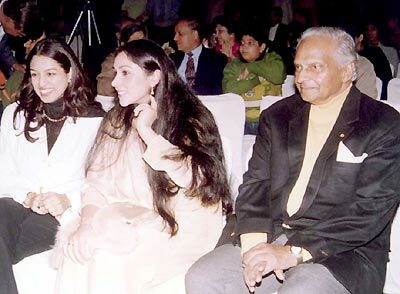 Princess Diya Kumari (center) and Maharaja Bhawani Singh enjoying Raghavendra Rathore's special show on January 30, 2002. Mom Rajawongse Priyanandana Rangsit, the former Rani of Isarda, is a royal princess of Thailand. She married Maharaj Kumar Jagat Singh on May 10, 1978. However, the marriage did not last and the two later divorced. They also had two children: A son, The Raja Saheb Shri Devraj Singh born January 13, 1981. A daughter, Raj Kumari Lalitya Kumari Singh born February 3, 1979. On February 5, 1997 the Raja Saheb Jagat Singh of Isarda passed away in London, and his son the Kumar Devraj Singh succeeded as the new Raja of Isarda.